"Bees are incredibly good at picking up what's in their environment." 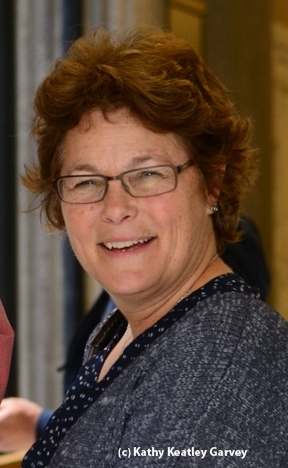 So said Senior Extension Associate Maryann Frazier of Penn State when she addressed the UC Davis Department of Entomology and Nematology's seminar last Wednesday, April 2 in Briggs Hall. Frazier, on a trip to California to discuss her research with the Marin County Beekeepers, took time out to travel to the UC Davis campus at the invitation of Master Beekeeper/writer Mea McNeil of the Marin County Beekeepers and associate professor Neal Williams and assistant professor Brian Johnson of the UC Davis Department of Entomology and Nematology. 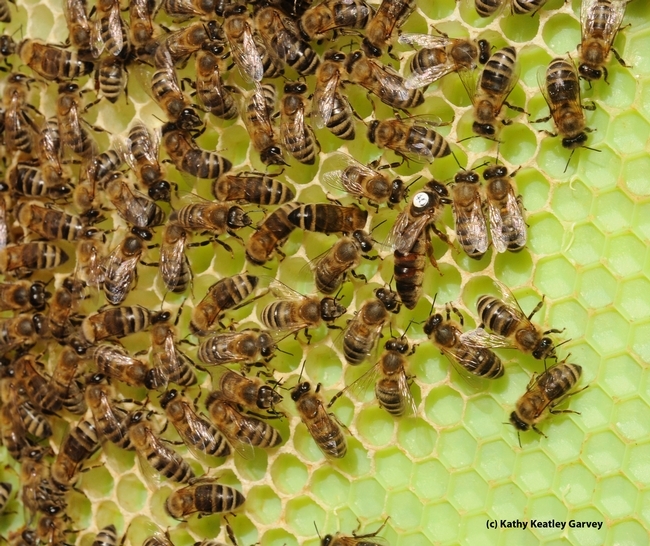 Frazier, a 25-year extension specialist, expressed concern about the pesticide loads that bees are carrying, as well as the declining population of bees and other pollinators. Beekeepers, she said, used to be much more concerned about colony collapse disorder (CCD), that mysterious phenomenon characterized by adult honey bees abandoning the hive, leaving the queen bee, brood and food stores behind. CCD surfaced in the winter of 2006, but today, when beekeepers report their winter losses, "they're not blaming CCD any more," she said. Frazier listed the prime suspects of troubled bees as poor nutrition, mites, genetics, stress, pesticides, nosema and viruses. "Varroa mites are a huge issue," Frazier said. 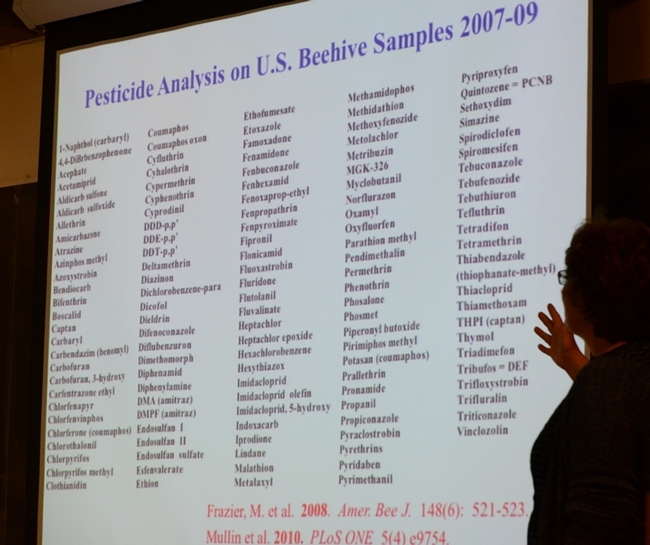 Turning to pesticides, she said a 2007-2010 U.S. analysis of some 1000 samples (wax, bees and flowers) showed "an astonishing average of six pesticides per sample and up to 31 different pesticides per sample." The analysis, done by U.S. Department of Agriculture's Agricultural Marketing Service Lab (USDA/AMS) screened for 171 pesticides at parts per billion. The samples involved a CCD study, apple orchard study, migratory study and submissions from individual beekeepers. Frazier compared the interaction of pesticides in bees to the interaction of medications in humans. When you go to the doctor, you'll be asked the names of the medications you're taking, she said. The "interaction" situation is similar to what's happening with the honey bees. In a bee colony, lethal exposures to pesticides are easy to see, Frazier noted. "You'll see dead bees, bees spinning on their backs and bees regurgitating." But the sub-lethal effects can mean "reduced longevity, reduced memory and learning, reduced immune function and poor orientation." Marin County Beekeepers recently undertook a similar study of pesticide analysis, raising $12,000 to do so ($300 per sample). "Marin is very mindful of pesticides, probably more than any other place," Frazier said. McNeil agreed. The results are pending publication. The approach of more regulatory agences assessing risk and protecting the environment"
As the seminar participants left Briggs Hall, many could be heard discussing the take-home message: "average of six pesticides per sample, up to 31 pesticides per sample." WE have know for years that DDT,etc are bad for humans, why has it taker so long for us to realize that pesticides are bad for the entire environment! I believe it is greed of the commercial growers and Mansano.